Welcome to the very first Fleet Tactical Command developer blog. My name is Jordan and I'll be talking about the procedural planetary system used in FTC. We'll try to post a blog similar to this once week to show the progress that the game is making up until the games release. So before I delve into the blog I'd like to just quickly plug a few things and introduce the project for anyone new here. 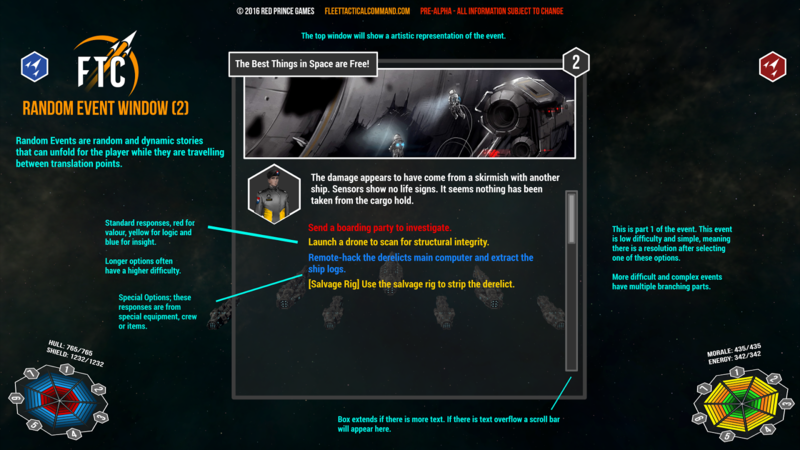 FTC is a roguelike space management game that blends tactical and role playing game elements. Most of the content is procedural generated including systems, events, items and some character customisation. You play as an officer who has been quickly promoted to fleet commander and must assemble a rag tag band of ships and crew members to uncover the mystery of your home world's destruction. Naturally if you'd like to find more information about FTC including the story, design and features I urge you to check out the links in the navigation bar above. Alright so with that out of the way lets get started. When Richard and I discussed the design decisions behind FTC we both came to the conclusion that speeding up the development of FTC would include that a majority of the game is procedural generated. When designing games with procedural generated content you have to ensure that your game doesn't lack content. Looking at some recent examples like the poorly received on launch game No Mans Sky it's easy to see that even if filling your world with some quintillions of planets and star systems is impressive but in the end it won't matter if your game lacks content and variety. To ensure that our game doesn't lack the content and variety we are planning for, the procedural planetary system was designed as a sort of semi-procedural system. We can still generate an almost infinite amount of different planetary systems with different stars, planets, moons, space stations, asteroid belts, and jovians with a ease of entering in a seed number and watching the system come to life. Once the system has been generated we can go through the generated system and hand craft the elements we don't like, such as the orbiting planets, the radius, the planet types, the asteroid field distance and height. All completely customisable to our hearts are content. If you'd like to see a tutorial or a better explanation of how this was achieved feel free to write to us or connect with us on our Discord where we will be happy to answer any questions. I'm Richard, the lead designer and I'm going to talk about random events in FTC. Random events are stories that unfold randomly while the player is travelling through space. Random events can pop up anywhere and come in various forms. 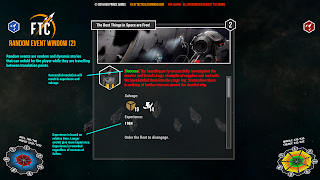 They range in difficulty and complexity, and can provide great rewards or cause massive damage to your fleet. These events come in the form of a window that displays the random event name, its difficult and gives the option to the player whether to engage in the event. Random events are optional and players can choose not to participate in them if they don't want to. 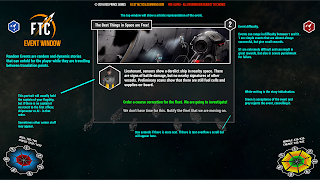 The window also shows some 2D artwork about the event and (usually) the commanding officer of your flagship, however sometimes other officers will appear in the communication window. Once the event is accepted, a player is provided with various options. FTC has three main stats, valour (red), logic (yellow) and insight (blue), which follow different solution paths. Valour solutions usually involve aggressive or impulsive action, but can quickly lead to violence. Logic uses problem solving or cunning, but can take time or backfire. Insight solutions involve diplomacy or intelligence, but can lead to new unforeseen problems. Once a solution is selected the dice are rolled. 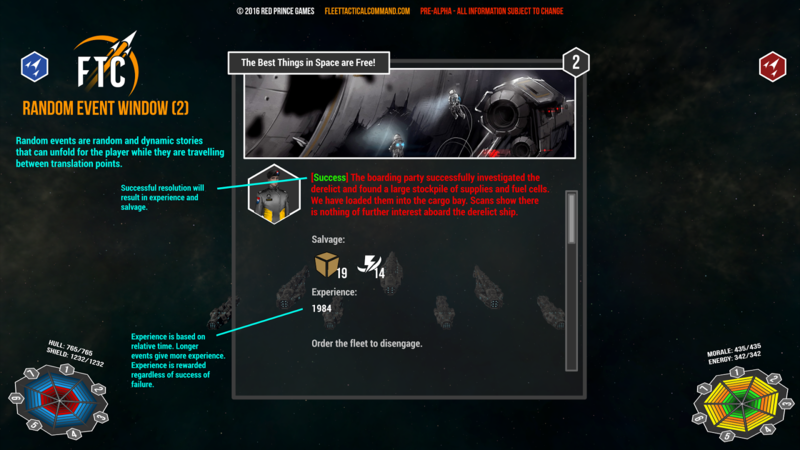 Random events are solved through RNG and are based on a percentage success rate relative to the fleets stats. In most cases, simple random events can be solved with a high chance of success, but more difficult events may be a gamble. More complex events have multiple branching story paths that can lead to great rewards or great disaster. As long as a player's fleet plays to it's strengths it should be able to survive most random events. Players can also choose to install custom bays on ships in their fleet, which allow players to solve random events in certain special ways. 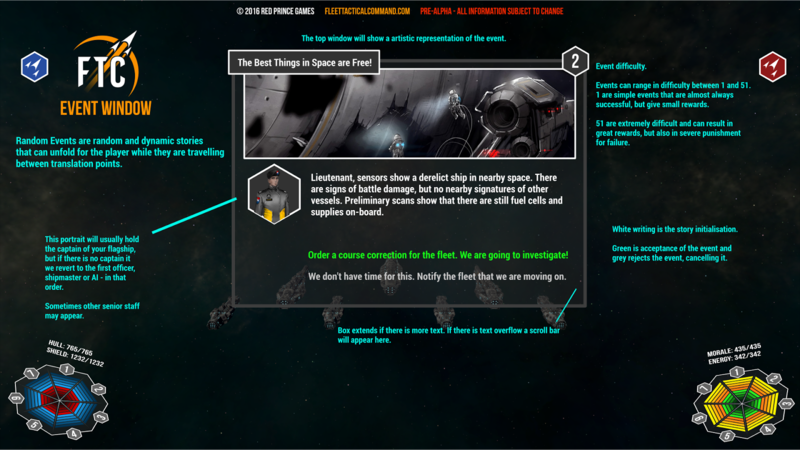 Random events were inspired partly by FTL by Subset Games and DnD. 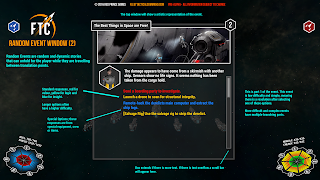 It creates more complex and varied story events than FTL, while not as complex as DnD hand crafted events, it finds a middle ground which still engages the player. FTC will include hundreds of hand crafted events with multiple branching solutions that will add a sense of adventure and narrative to FTC gameplay. We are working around the clock to develop a playable demo and add all the features FTC will have in the final release. Keep an eye out for future devblogs or join us on our discord server.